Today is day three of the finding fall home tour. If you missed day one and day two, click here for a list with links to all 16 homes (and Better Homes and Gardens) on the tour including The Yellow Cape Cod (day one). This is one tour of homes you don't want to miss! While decorating my home for fall, I created a simple centerpiece for the dining room table. 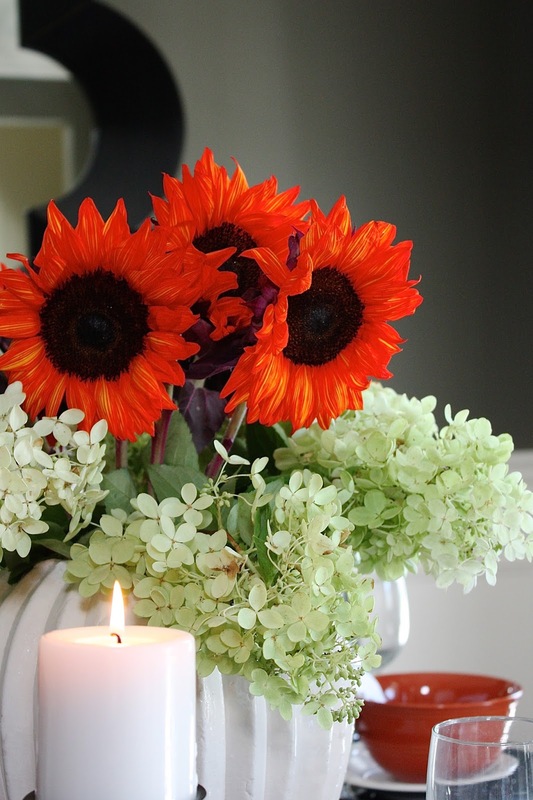 This arrangement is large in scale, bold in color and makes a big statement for just under $25. I began with a really cool piece of pottery from a discount home store ($15). I loved this piece because the shape reminds me of a pumpkin. The white vase really pops against our black table and was the perfect base for an eye-catching centerpiece. Just in case this decorative piece of pottery is porous, I placed a skinny vase inside to hold water. 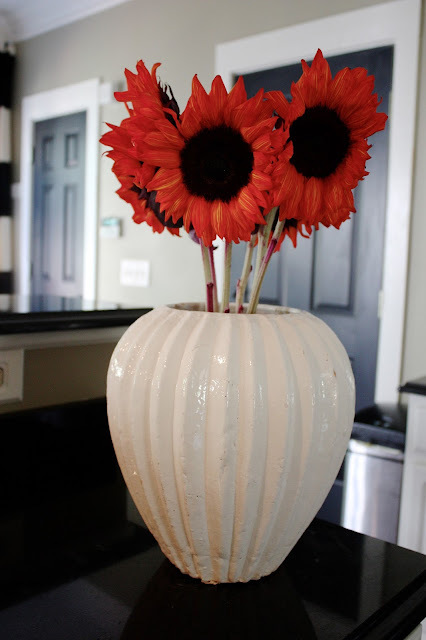 To keep the skinny vase from tipping over, I stuffed plastic grocery bags around all sides. While grocery shopping, I picked up a pack of sunflowers dyed bright orange ($8). I trimmed them (leaving them slightly tall) and placed them in the vase filled with water. To fill in around the base of the sunflowers, I used fresh cut hydrangea from our front yard. And that is it my friends. So easy, and less than $25. Throughout the fall season, I will freshen this arrangement by replacing the $8 grocery store flowers and new yard clippings as needed. For more seasonal decor/entertaining ideas, please click here. Very cute - vase is perfect shape! Love the 'vase in a vase'. Looks great. Can't wait to get my fall decorating on! Honey, I follow your blog and love it but I'm just wanting to help you a tad bit...comb your hair and pull it all back into that ball on the back of your head. Lordy, people would take you more seriously if you did! Eek! Agree with Steph. There's no reason to be unkind and your statement is very unkind. Are you really going to stop following this woman and her really great blog because her hair fell out of her pony tail? Seems there are bigger thing in this world to fuss about.